Arriving in a Humvee, former Gov. 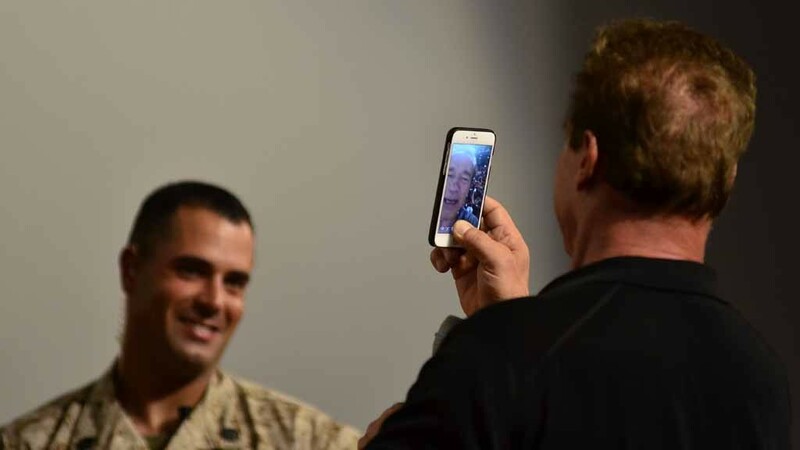 Arnold Schwarzenegger was greeted Sunday by a thousand Marines and family members at the world premiere of his latest Terminator movie — at the Camp Pendleton base theater. Schwarzenegger shouts one of his famous lines from one of his movie. Marine Gabriel Parks, attending the premiere, is a huge Schwarzenegger fan. “He’s my hero,” Parks said. “He’s gotten me through a lot that I’ve done in the Marine Corps, thinking about him and what he’s gone through and everything he’s done. A fan brought a baby wearing a onesie with one of Arnold Schwarzenegger’s premiere sayings. Schwarzenegger signed the outfit. The motivation comes from “his appearance and the way he conducts himself and all the stuff he has competed in physically and mentally,” he said. “I’ve listened to a motivational speech that he’s given. Marine Anthony Suarez, first in line at 6 a.m. for the 3:30 p.m. showing, also is no ordinary fan. That’s still his favorite movie, he said. The movie screened (for free) at the Vandegrift Boulevard cinema two weeks ahead of its July 1 nationwide release by Paramount Pictures. Brig. Gen. Edward Banta — the top Pendleton officer — introduced Schwarzenegger, who arrived at 3 p.m. The 67-year-old actor said he wanted the Marines to be the first to see the movie because of their role in the nation’s defense. 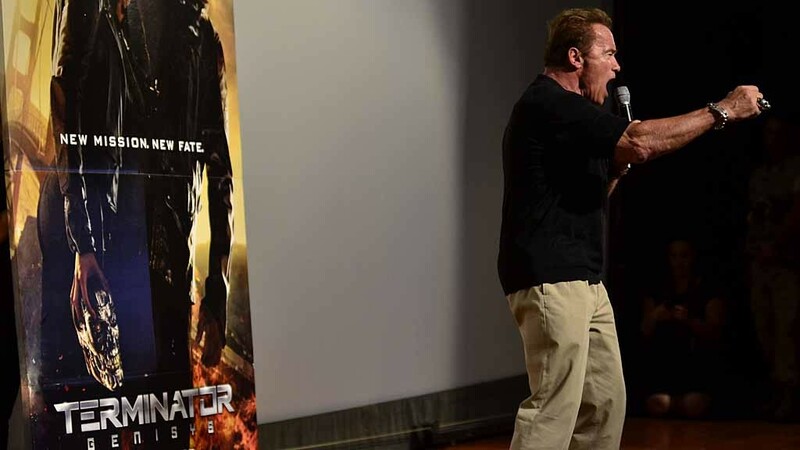 The sci-fi action hero of “Terminator: Genisys” — reprising his role as T-800 — signed autographs for 15-20 minutes and then spoke 10 minutes before the start of the movie. It is his fourth Terminator movie. 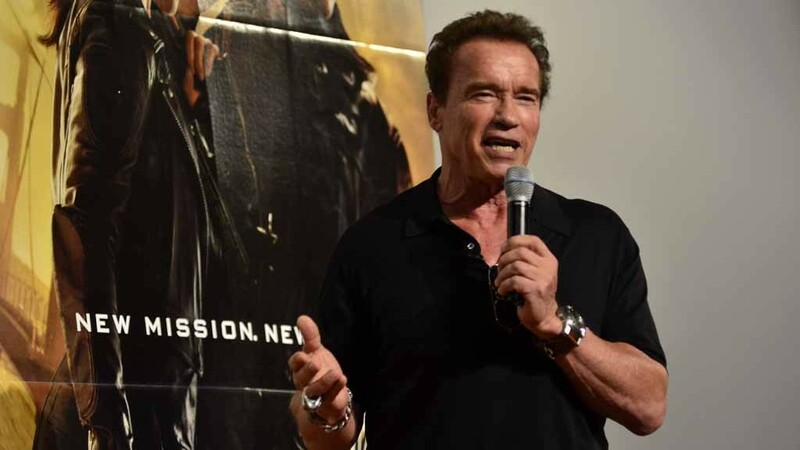 A fan brought a baby wearing a onesie with one of Arnold Schwarzenegger’s famed sayings. Schwarzenegger signed the outfit. Schwarzenegger yells, “Hasta la vista, baby!” to the thrill of the audience. Former Gov. 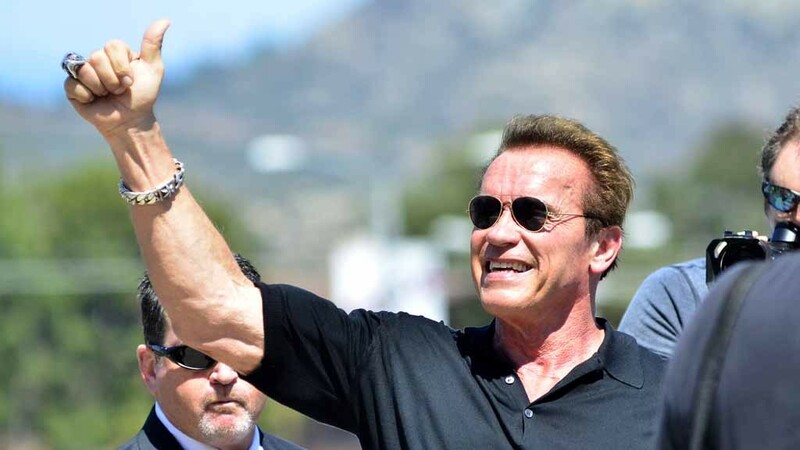 Arnold Schwarzenegger greets about 1,000 fans at the premiere of his new movie. 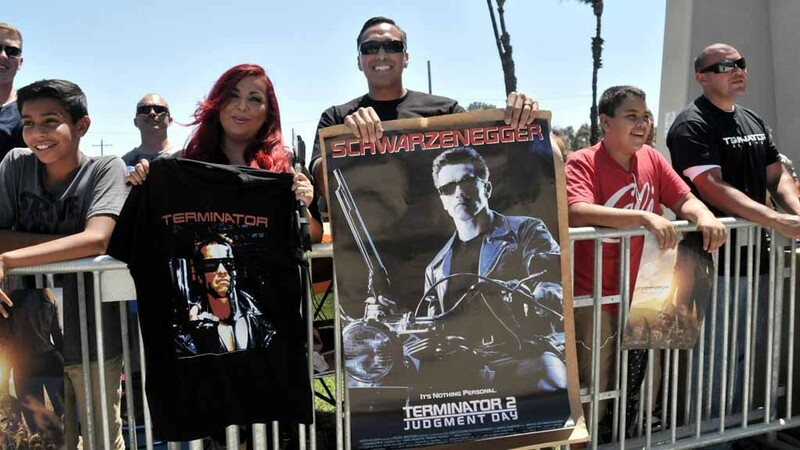 Schwarzenegger signed photos, posters and other items the fans brought. 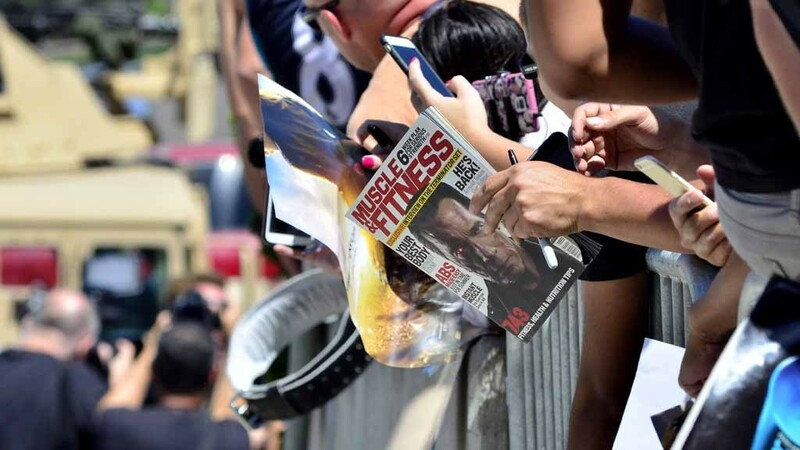 A fan waits for Schwarzenegger to come by and sign his magazine. 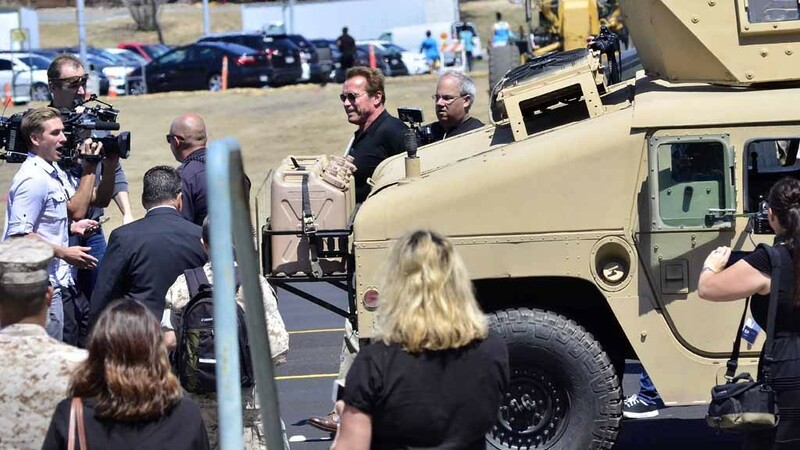 Arnold Schwarzenegger emerges from a military Hummer was he arrived at the movie theater. Schwarzenegger speaks to the cheering crowd before the movie starts. 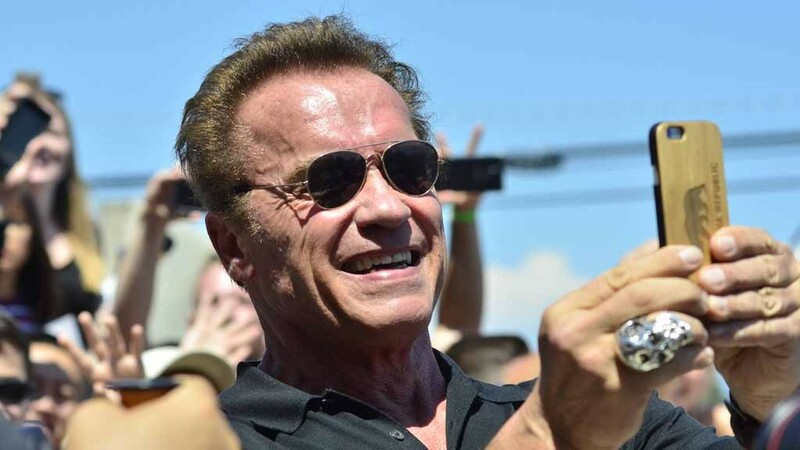 Arnold Schwarzenegger gives the crowd of well-wishers a thumbs up. 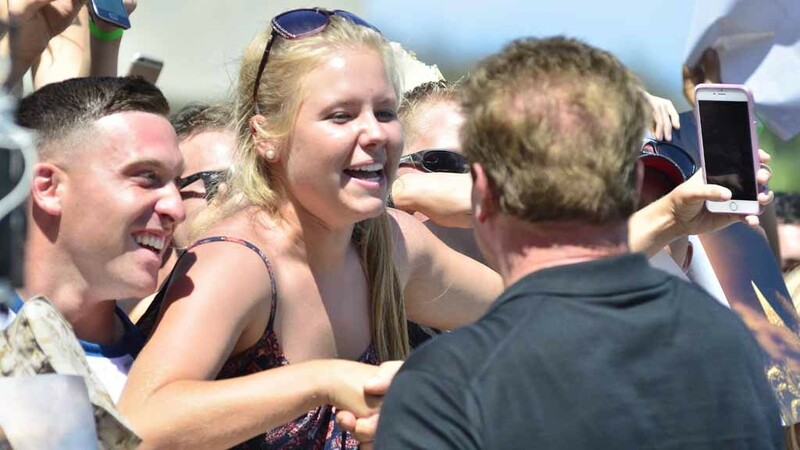 An excited young girl gets ready to hug the former governor and movie star for a selfie. 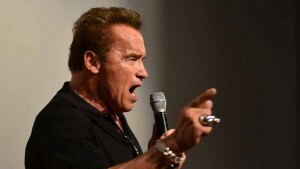 Schwarzenegger shouts one of his famous lines. 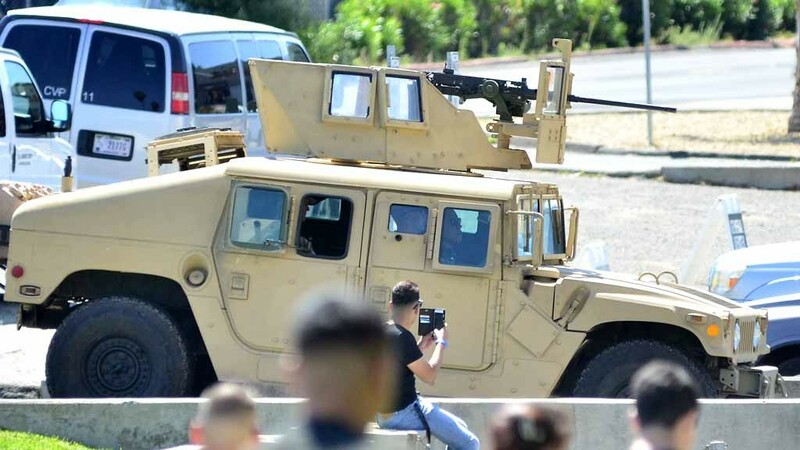 Schwarzenegger can be seen in the front seat of a Hummer as he is taken back stage of the theater. 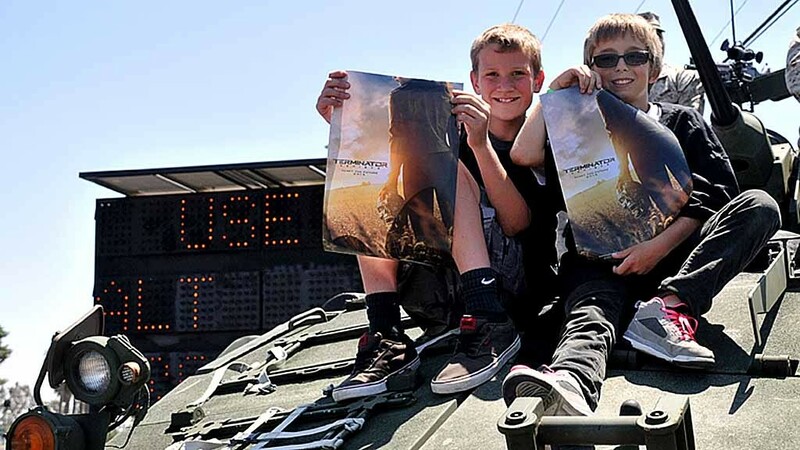 Young fans display posters as they sit on a tank outside the movie theater. The marquee advertises the premiere of his movie on Camp Pendleton. 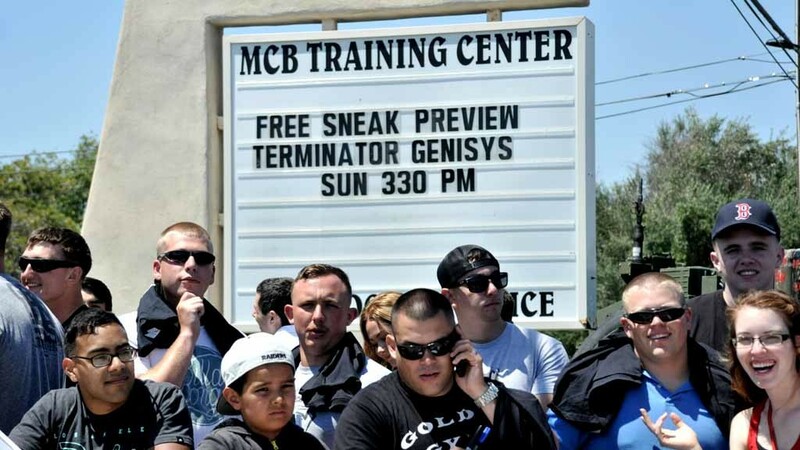 Marines wait with items they want Schwarzenegger to sign. Brig. 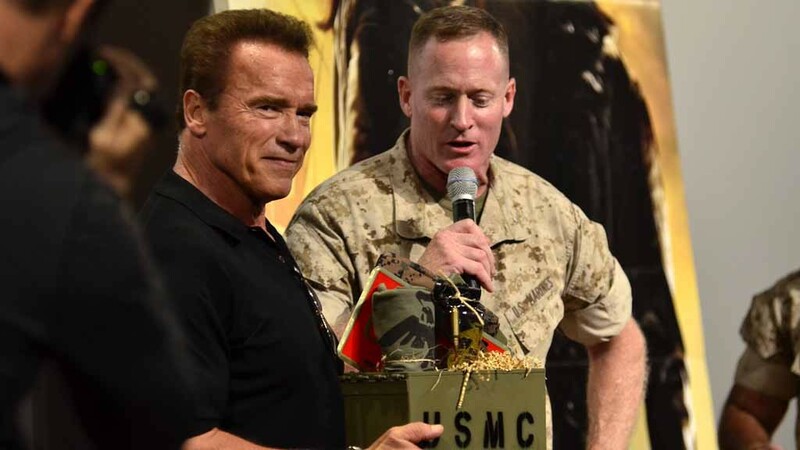 Gen. Edward Banta awards Arnold Schwarzenegger a case with Marine items. Schwarzenegger can be seen in his iPhone as he makes a movie of his visit. 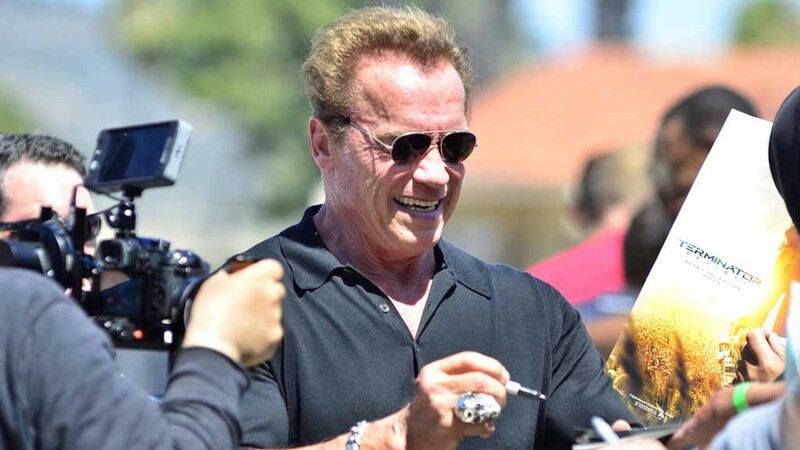 Military family members show items they brought for Schwarzenegger to sign. Schwarzenegger is surrounded by fans, Paramount Picture photographers and military. 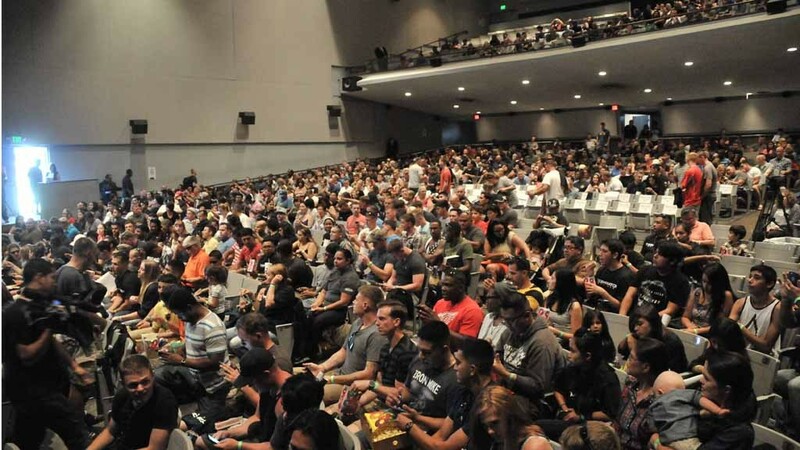 About a thousand fans eagerly awaited the start of the premiere showing of Schwarzenegger’s new film. 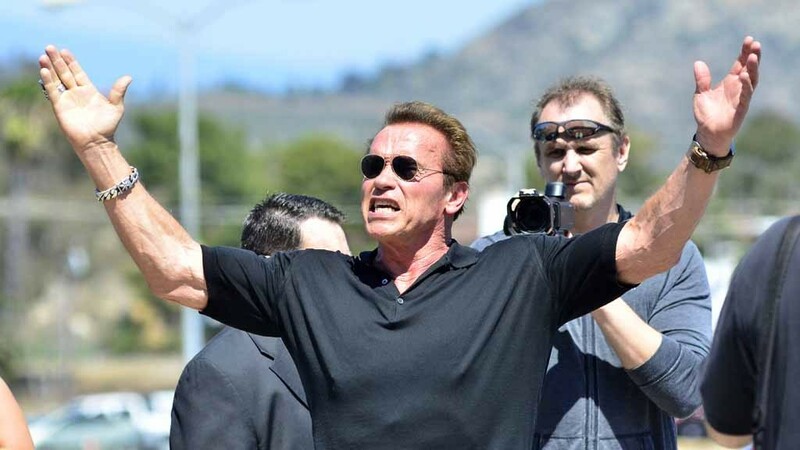 Fans scream with excitement as Schwarzenegger approaches.